Is there anything better than a summer holiday? The UK is fab, of course, and we are having some rather dreamy weather right now, but there’s nothing quite like getting away from home and travelling to some exotic place in the world. Holidays are always about sensory experiences, with beautiful sights to feast one’s eyes upon, tastes that are out of this world and not to mention the smells – oh the smells, the scents of oceans crashing against rocks, of heady spice markets and bronzed skin on the beach. Holidays smell awesome, for sure but they feel amazing too, presenting an opportunity to reset, relax and revel in sensory overdose. Of course, it’s not always possible just to pack one’s bags and drift off to some exotic location whenever the mood strikes. Life often gets in the way and as much as holidays are awesome, they’re also quite hard on the bank account too. Luckily for us we have perfume, that wonderful medium that allows us to travel to any place in the world or anytime just through one spritz. Fancy a trip to the lavender fields of Provence? No problem, fill your nose up with a few spritzes of something suitably lavender-esque and you’re right there, in the middle of the Grasse. One collection of fragrances that works perfectly as a ‘holiday in a bottle’ is Acqua di Parma’s Blu Mediterraneo collection. 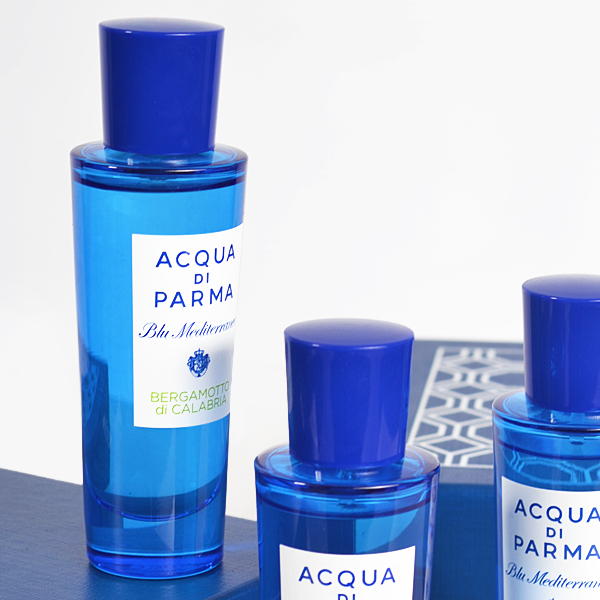 Think of this lovely blue-coloured collection as a fleet of planes – it’s an olfactory airline that is ready to take off and fly the wearer to an array of Italian destinations, ranging from the Amalfi Coast to the Isle of Sardinia, and all that’s in between. 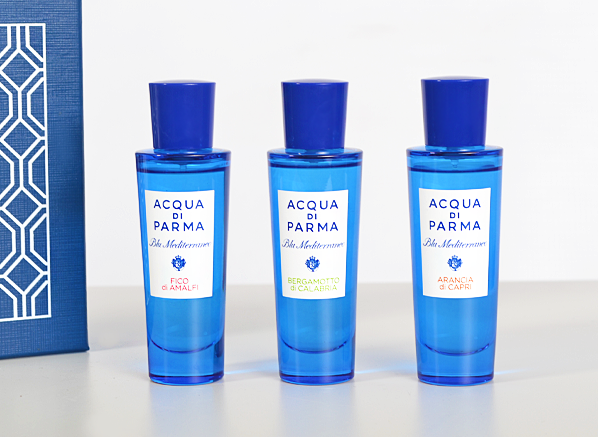 To celebrate this collection, Acqua di Parma has launched a beautiful set of three travel sprays so that you can enjoy the ‘greatest hits’ from the Blu Mediterraneo collection in a handy 30ml size – perfect for packing in your suitcase or simply to take you away to the heart of Italy, even if your wallet won’t stretch that far. If you like the zesty sunniness of orange then Arancia di Capri is going to get a lot of time on your skin. This scent is all fruit, flowers and musk, boasting the airiness that is the signature of the collection. 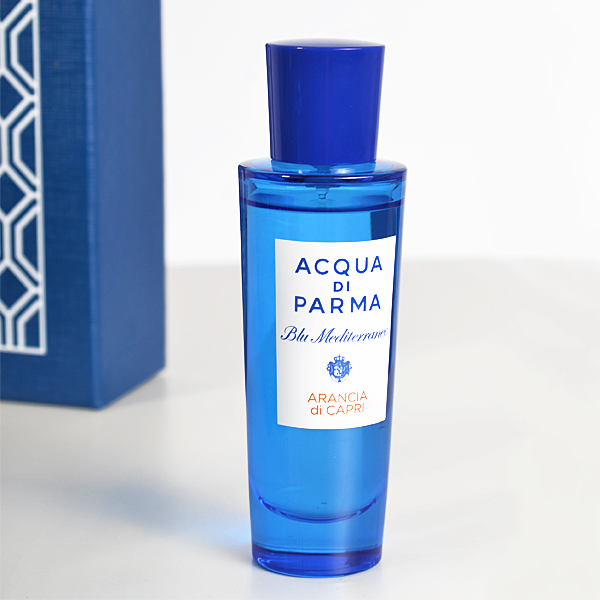 The signature may not be as bold as Acqua di Parma’s other offerings, but it sure is as enjoyable! The fragrance starts with a big squeeze of glistening orange juice, and we’re talking the good stuff here not your average bottle of Sunny Delight. This is premium, A grade, ‘I just twisted ten oranges to make a tiny amount of juice’ kind-of-stuff and whilst it lasts on the skin it is incredibly enjoyable. But the good things in life never last and before long the full ripeness of orange is all but a memory. We shan’t lament the loss of orange though, as Arancia di Capri has a few tricks up its sleeve and slowly, but surely, it pulls out a wonderfully hay-like neroli note that is instantly reminiscent of the warm air trapped amongst a sea of orange trees – a grove of beautiful flowers and fruit, if you will. This effect does stick about thanks to the solidifying nature of musk and makes for a fragrance that is undemanding and joyful. 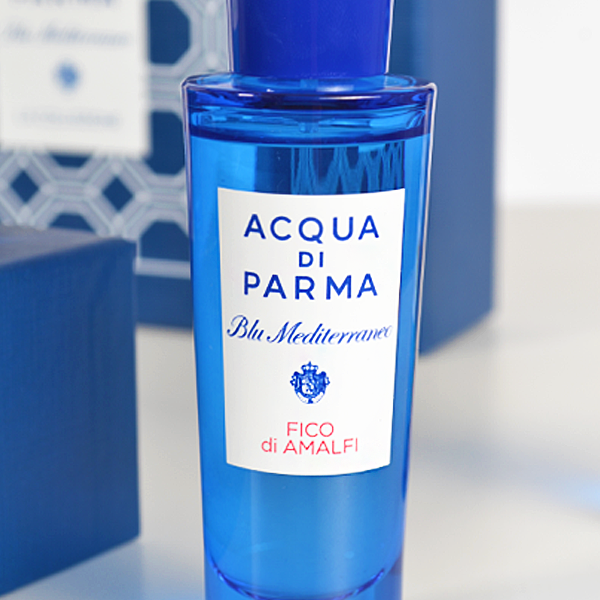 Fico di Amalfi is my absolute favourite within the Blu Mediterraneo collection. It manages to present the jammy, fruity deliciousness of figs but in a manner that is entirely transparent. It’s almost as if it catches the scent of figs on the breeze, blending them with the salty sea air. Fico di Amalfi has a milky texture that evokes the idea of sunscreen and it places one straight on the beach, soaking up the sun and sipping on a delicious fig cocktail. Take me there now! Bergamot is the best smelling thing on Earth. Fact. Another fact for you is that bergamot is most heavily produced in Calabria, Italy. So it’s no surprise that the shining jewel in the Blu Mediterraneo crown is Bergamot di Calabria. This perfume is joy bottled. It’s the smell of delight, of refreshment and of sunshine. I find it completely revitalising and it’s very easy to wear, meaning that you may drain that little 30ml bottle in no time at all! Acqua di Parma’s ode to Italy’s yellow fruit is very much what one would expect from a bergamot fragrance. It captures every facet of the fruit perfectly, from the sparkling sherbet sweetness of the opening to the more bitter lemon edge in the heart, before moving to a more lime-like tartness in the base. This fragrance is a big squeeze of bergamot and it smells simply delicious. Bergamotto di Calabria isn’t all about bergamot though and as it dries down it gains an even more multi-faceted persona, diverging into waves of sharp ginger and dashes of smooth (and almost powdery) woods and musk. It would be difficult to find a bergamot fragrance that is more satisfying than this one and for that reason, it should be considered as a summer staple for any lovers of the note or just citrus-based fragrances in general. This entry was posted on Wednesday, June 28th, 2017 at 9:30 am and is filed under Candy Perfume Boy, Fragrance, New products. You can follow any responses to this entry through the RSS 2.0 feed. You can skip to the end and leave a response. Pinging is currently not allowed.